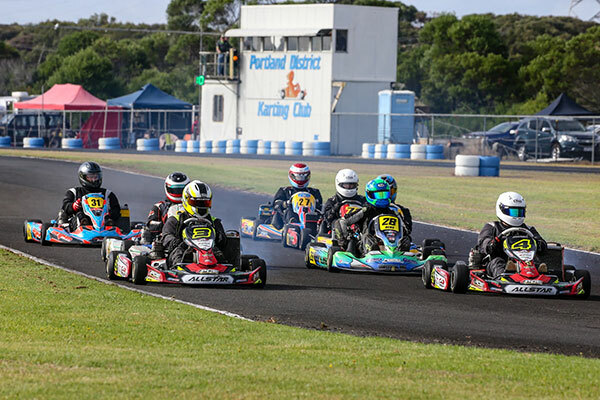 The Portland and District Kart Club has hosted another bumper round of the 2019 DPE Kart Superstore Victorian Country Series over the weekend, hosting a very impressive 220 entries. The event at Yarraman Park was hosted in cool conditions for most of the weekend, overnight rain making the opening heat on Sunday morning very interesting. 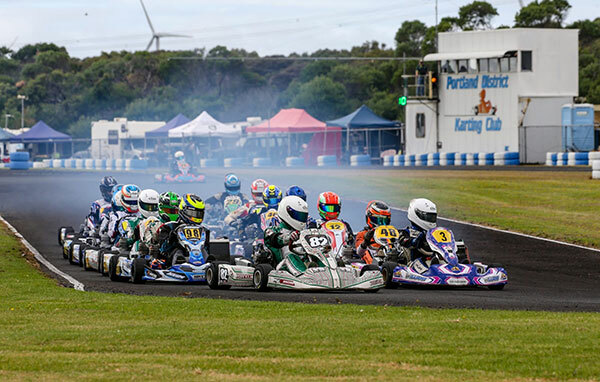 The racing was again superb, and the series’ reputation continues to grow, as it rightfully assumes the title of one of the best series in Australian Karting. Scott King fired the first warning shot in qualifying, storming to pole at his home track. His time of 36.330 was 0.539 clear of Beau Humphrey in second, with Aaron Jackson taking third ahead of Nicholas Roberts and Nikola Schmidt. Paul Feely’s qualifying didn’t make the timing strip as his LHR wheel left the kart on the infield sweeper. Heat 1 was held in wet conditions after overnight rain, and Scott was again the benchmark, leading every lap to take the win. But hot on his tail now was Adam King, who had qualified well below expectations in sixth. Now rolling around in second, Adam grabbed the fastest lap along the way. Beau Humphrey filled third, ahead of Stephane Majman and Schmidt. Jackson was the highest placed on slicks, a lap down in sixth. Heat 2 had drama even before the start as Jackson was out of the race at the end of the back straight on the roll around. Once the race got underway it was again Scott King who led every lap on his way to a second win. But again it was Adam in second who grabbed the quick time. Humphrey again settled in third, although was under pressure from Schmidt in fourth, Roberts holding off Ray Dumesny and Feely to grab fifth. 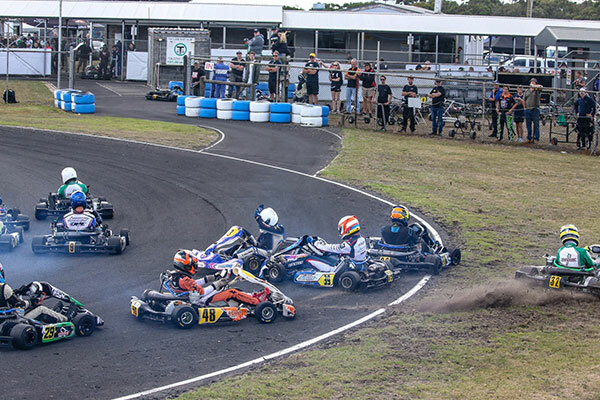 The King Brothers would again headline the starting grid for the final, but it only took one corner to unravel as one of the major incidents of the weekend took place at turn one. Contact between Humphrey and Adam King would result in King being pushed sideways across the grass at pace by Humphrey. The two came to rest on the adjacent stretch of track after skipping the hairpin. Chaos ruled as the rest of the class scuttled to avoid them. Schmidt was also hampered, short cutting across the grass. Humphrey would later be disqualified from the meeting for his part. Once the racing settled down, Scott went about his business without fuss and recorded a solid victory. Adam provided one of the outstanding drives of the day as he hunted down the field and eventually returned to second place and a podium, after being a long, long way back. The battle for third was a good one, but in the end it was Roberts who prevailed over Jackson and Feely. Pole position in KA3 Junior belonged to Ethan Bray, nailing a 37.153 to sit clear of the field. Isaac Woodhouse continued to be a contender in this class, posting the second fastest, only just ahead of Samuel Gibson and Bronson Boult. Ethan Brown fifth fastest. Heat 1 started well in slippery conditions for Bray, leading the first four laps before finding himself facing the wrong way at the hairpin after a touch with Woodhouse. Woodhouse raced on to record a comfortable victory, ahead of Brown, who again proved to be a fierce racer. Third across the line was Gibson, but he was subsequently disqualified, handing the position to Jaxon Johnstone ahead of Boult and Patrick Short. 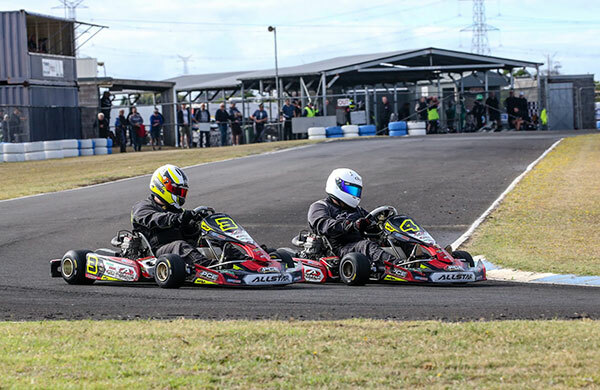 Heat 2 saw Johnstone show the glimpses of speed that carried him to victory at the opening round in Warrnambool, as he quickly emerged as the leader in the early stages, never being headed. Woodhouse continued to accumulate points at the front, finishing second ahead of the Ethan’s, Brown and Bray. Gibson with the fastest lap in fifth. The Final started with Johnstone leading Woodhouse, until they swapped positions on lap 5. Lap 5 would also correspond with the start of a stunning run from Bray, who managed to work his way up to the lead at just the right time, taking the chequered flag and the win. Bray would have to work his way up to and past Woodhouse, leaving him to settle for second ahead of Boult, the latter having started eighth. 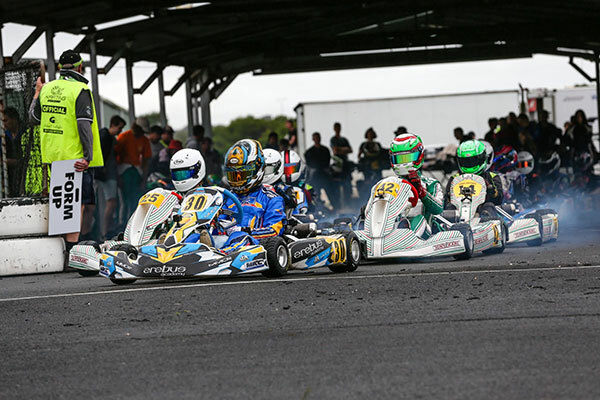 Brown banked the points for fourth, ahead of Tasmanian Fletcher Bellars in fifth. Phil Smith looked fast from his first flying lap and proved to be the man to beat after posting the only sub 38 second lap in qualifying (37.901). 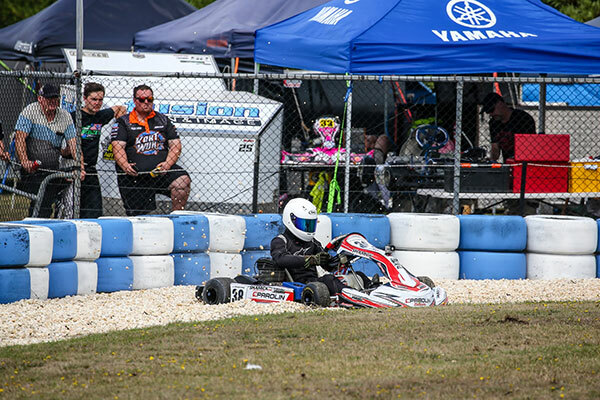 Peter Gigis was fastest in qualifying at Warrnambool and showed that he would be a factor, second this time around. Garry Haywood and Ian Branson were hard to split on the time sheets, just clear of John Page in fifth. Heat 1 was turned out to be the first of Smith’s clinics, as he showed superior speed and class in the greasy conditions. He would ultimately win by over four seconds from Branson and Page. Ash Mitchell moved forward from a low by his standards qualifying, edging Gigis for fourth place. No positional changes in the top five after lap three. Lights to flag for the dominant Smith in heat 2, he was in a groove that no other competitor had an answer for, setting fastest laps comfortably clear of his rivals. Mitchell continued his march forward, this time crossing the line in second place. Haywood continued to show glimpses of his pace, leading home Leon Forrest and Branson for third. The final was the completion of a perfect set, as Smith finished grinding the opposition into the ground. His combination was untouchable, and he thoroughly deserved the victory. Mitchell was the best of the rest for the majority of the final distance until he got squeezed on the infield, dropping to sixth. From second to sixth was covered by about seven tenths at the line after a frantic last two laps. Haywood would prevail over Branson, Gigis who had been as low as ninth and Forrest. 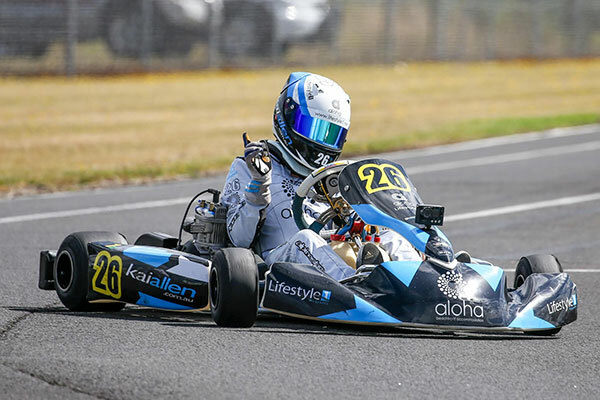 Multiple Australian Junior Champion Kai Allen made a big impression in his first VCS meeting as a senior, topping the qualifying time sheets. His time of 35.466 was just 0.005 clear of Jake Spencer, and less than two tenths ahead of Will Carroll and Nick Percat. Nathan Williams not far away in fifth. Heat 1 was all about tyre choice, as many of the front runners chose to use slicks rather than wear out wets as the track was more damp than wet after the rain had finished. Wets would still be the faster choice and Ben Delaney made the best of the conditions to charge from seventh to the lead in two laps to take the win. Just as impressive was Connor Farr’s run from eleventh to second. Williams was the only one of the front runners to stay in the lead bunch, grabbing third ahead of Curt Sera and Blake Purdie. Heat 2 was over before it started for Delaney, as he frantically tried to get his chain back on during the roll arounds, but it was sadly to no avail. It allowed Farr to take the early ascendancy, until he was relegated by a hard charging Williams just after mid race. They would take first and second, ahead of Percat and Spencer, both having driven superbly to drive through the field from deep starts. Sera capped off the top five. An opening corner fracas caused had a major effect on the final as several contenders, including Williams, Sera, Spencer, Purdie and Carroll were all shuffled down the order, and Delaney was eliminated. Farr and Jordan Rae emerged as the front runners, until Allen came through like a missile from twelfth to third on the opening lap and then into the lead by lap five. He drove away from the field from there to win by 5.2 seconds. Percat used his race craft to move to second as the best of the rest, having a good race in a pack that included Rae, Farr and an emerging Maverick Benson. Percat home in second, Rae in third by just 0.001 over Benson for third and Farr slipping to fifth. Josh D’Ambrosio and Johnny Hill were virtually inseparable in Warrnambool and Portland would prove to be no different. D’Ambrosio grabbed pole with a 38.762, just 0.019 ahead of Hill to set the scene for the weekend. Charlee Richardson was right in the mix in third ahead of Toby Waghorn and Riley Jabke. Hill got the better of the start of the opening heat and led for the majority of the race, however on the final lap his nemesis, D’Ambrosio, slipped past a snatched the win. Waghorn was third over the line, but was disqualified for a technical infringement, handing third to one of the hardest racers in the field, Max Fahey. Richardson finished fourth ahead of Seth Burton. The race included a tough break for Jabke as he lost a wheel on the second circulation putting him out of contention. Heat 2 once again saw the combatants at it again as D’Ambrosio and Hill continued to scrap for the top spot. D’Ambrosio got the better of the duel by mid race, which saw Hill fall into the clutches of Fahey. They staged a compelling battle, changing positions regularly until Fahey retired on the final lap. Richardson pounced to take third ahead of Burton and a recovering Jabke. D’Ambrosio was a lights to flag winner in the final, as he continued his unbeaten run in the first two rounds of the series. The rest of the top five got a shake up as the field began to throw everything at Hill at the mid-way point of the race. Richardson was first to make the move as she continued on to earn a very impressive second place. Not long after and Jabke and Fahey raced their way into podium contention. Jabke taking third ahead of Fahey and Hill. Waghorn snared the fastest lap after moving from fourteenth to sixth. Ross Stubbs has been a frontrunner in Combined Light for some time now, and at Portland he nailed the pole position with a time of 37.526. Second belonged to Sprintcar champ Corey McCullagh, whilst Brock Rae, defending series champion Joseph Clough and Jono McKean rounded out the top five. Stubbs went on with things to win the opening heat in fine fashion. McCullagh had to overcome an early race dice with Clough before making second his own. Clough would eventually also succumb to Steven Malkin and McKean. Malkin home in third, ahead of McKean and Clough. McCullagh was first across the line in heat 2, in a strong performance given the extra downforce he was carrying over the class minimum. However, a dragging rear bumper ruined the result, causing him to be disqualified. 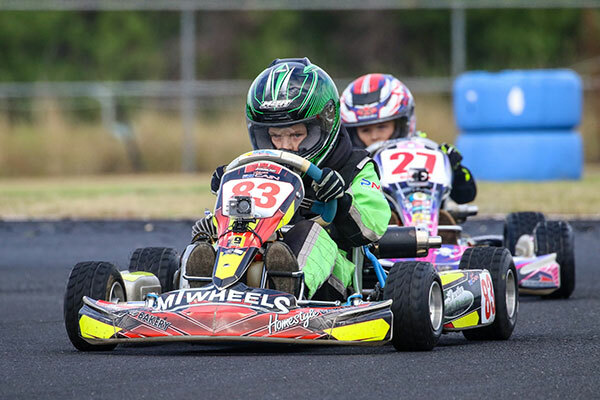 Everything was falling into place for Stubbs as he moved up to claim the top spot ahead of former Masters series champ Malkin, McKean, Clough and the returning Lachlan Hill. The Final was an epic race, with any one of the top six capable of winning. Stubbs and McCullagh initially battled it out at the head of the queue, until McCullagh plummeted down the order to seventh mid race. Stubbs would have to fight off a spirited Hill before claiming the win and a clean sheet of wins. Hill finished a fine second on his return to the series, ahead of McKean and McCullagh. McCullagh though had a case of déjà vu as he was disqualified for a dragging bumper for the second consecutive race. This allowed Malkin and Clough to round out the top five. Jobe Stewart was the round winner last year in KA3 Junior, and continued that momentum to snare pole in his first VCS round as a senior. His time of 36.713 was just 0.049 faster than the always fast Jack Bell. 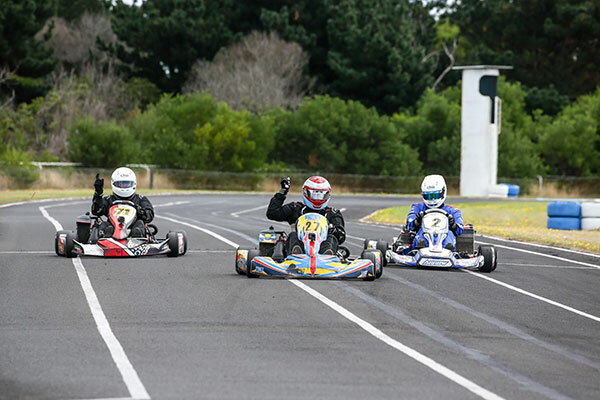 Third belonged to Joel MacPherson, fourth was Corey Herberton on his home track and Nikki Watson in fifth. 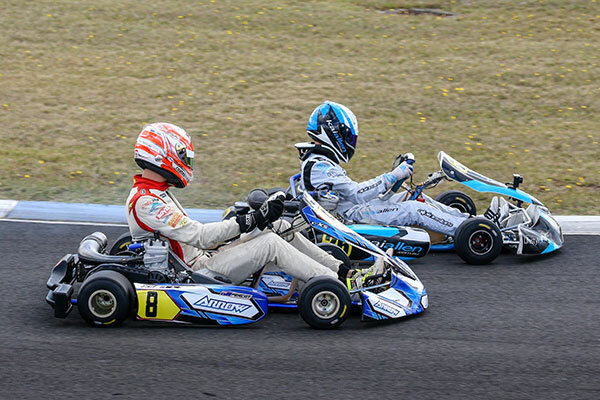 Bell got the better of the start in slippery conditions as he led Stewart in the early stages. Bryce Woollard made a mega start and quickly moved from ninth to third. But by mid race it was Herbertson who started to show his superior speed, bolting to the opening win. Stewart overhauled Bell on his way to second, Bell also dropping behind Woollard and MacPherson as he slipped to fifth. Conditions had improved by the second heat and Bell responded to his position slide in the opening heat to come out and win comfortably. Woollard was again hot at the start of the race as he assumed second position, before Herbertson and Stewart moved by to take second and third respectively. Nathan Williams had been as low as eighth early on, but came on strong to also grab Woollard for fourth on the last lap. The start of the final saw plenty of carnage and an almighty kerfuffle as everyone barring the leaders Herbertson and Bell had their positions thrown up in the air. Herbertson led until lap four, before Bell asserted his dominance, going on to win by 1.8 seconds over Herbertson. MacPherson crossed the line in third, but was handed a 10 second penalty, dropping him to twelfth. Stewart assumed the final position on the podium after rolling down as low as thirteenth. 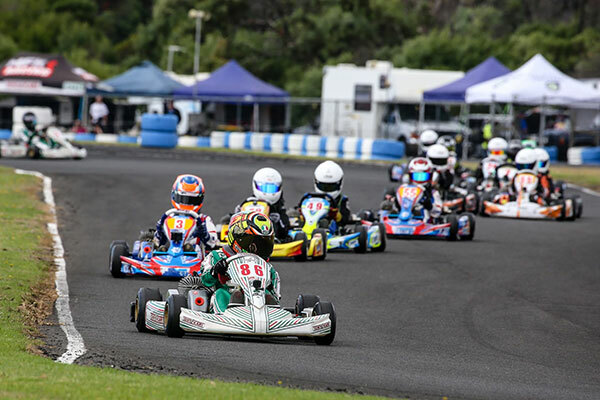 Jaxson Cox had his best result of the weekend to claim fourth, whilst Hamish Allan put in a stirring performance to charge from fourteenth to fifth. Scott King took his second pole position of the weekend by snaring pole in KA3 Medium with a time of 37.689, finishing just 0.005 ahead of Remo Luciani. 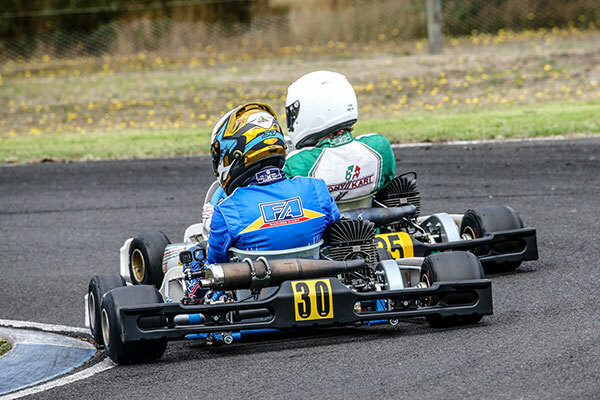 Youngsters Daniel Hookway and Taine Venables filled third and fourth ahead of Max Green. 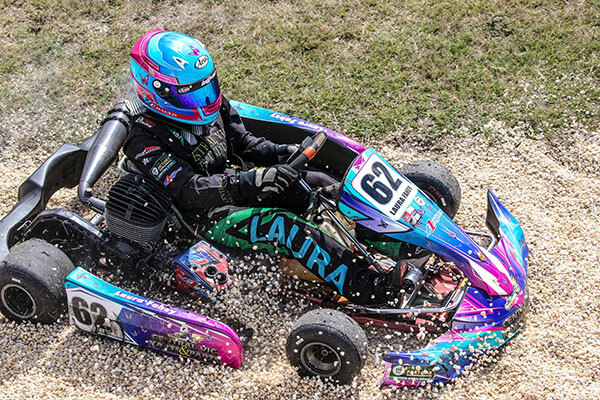 Conditions were close to the changeover from wets to slicks as karts rolled out for the opening heat, and a few drivers took the punt on slicks, notably Luciani. King made the most of his wets to take the win, although he was chased all the way by hard charging Hookway. Venables was third across the line, but disqualified post-race, elevating Todd Chambers to third after starting fifteenth as a result of not qualifying due to a prior engagement. Mitchell Mackay and Jackson Hodgetts rounded out the top five. Hookway jumped to lead in the opening lap of heat 2, however just one lap later King and Mackay moved to the top of the tree, Hookway struggling as he dropped down the order to sixth place. Luciani and Venables recovered from their tough opening heat to fill third and fourth, with Chambers again thereabouts in fifth. 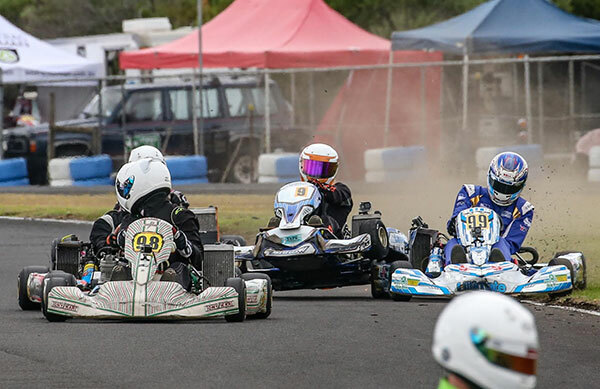 The early stages of the final were intense as King, Mackay, Luciani, Venables and Chambers battled for superiority. Mackay lead for a fair part of the final before King grabbed the lead and eventually the win. Mackay had a solid weekend to finish up second ahead of Venables, who had charged from eleventh to third. Luciani missed the podium for the first time in a long time but would be thrilled with the increasing level of competition, whilst Chambers landed fifth and the fastest lap. Cadet 9 had a fresh look for Portland, with only Chelsea Humphrey remaining from the first round podium. 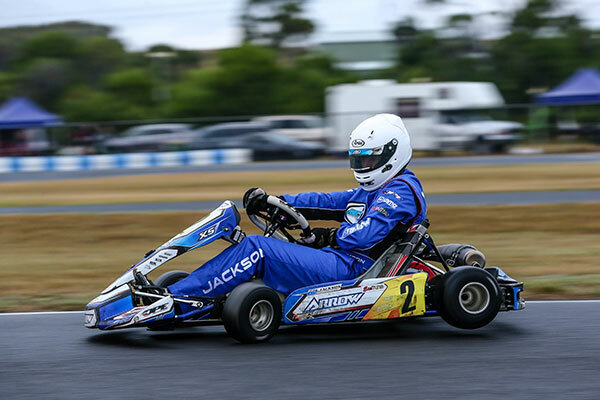 William Calleja showed speed that defied his P plates, storming to pole position in qualifying (41.530). Mathew Basso edged out Humphrey for second, followed by William Brinsley and Aston Hill rounding out the top five. Heat 1 was lights to chequer for Calleja, as the top five finished in the same order as qualifying. The carbon copy result came despite the damp conditions, Brinsley leading Humphrey early and Hill dropping as low as seventh on his way back to the top five. 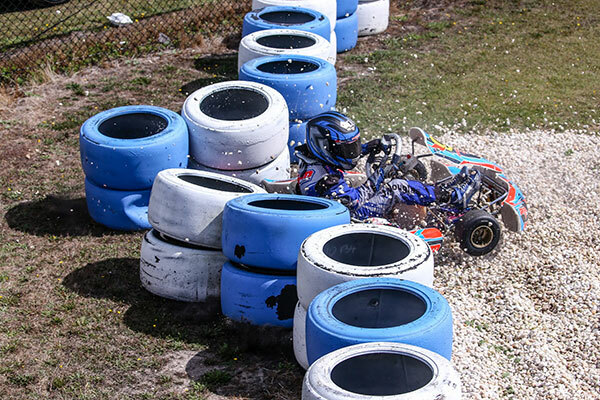 The opening lap of heat 2 saw trouble strike for Calleja as he plummeted down the order to sixth. Capitalising on Calleja’s misfortune was Humphrey, who held of Basso’s advances take the win. Calleja recovered for third, ahead of Brinsley and Hill. Despite the smaller numbers in the class, the final promised to deliver an entertaining race and didn’t disappoint. Basso and Calleja went at it, taking turns in the lead until Basso made a decisive move on lap nine. From there Basso was not headed, winning by 2.3 seconds. Calleja had to contend with pressure from Humphrey at the back end of the race, but did enough to secure second ahead of Humphrey. Brinsley had an uneventful run to fourth, whilst Cadel Taylor took his first top five of the weekend after a good run with Hill. 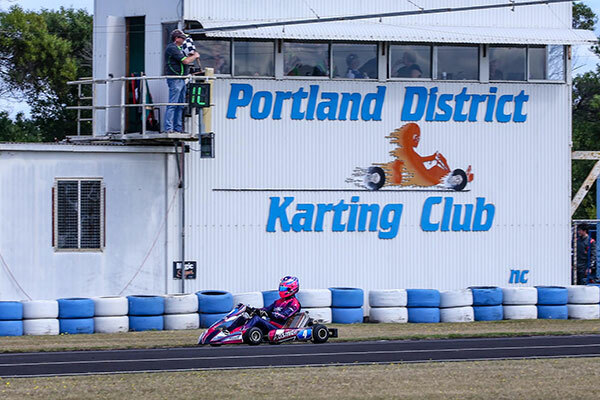 Remo Luciani arrived in Portland with a point to prove, after a racing incident robbed him of a chance at victory in the opening series round. He started perfectly by securing a comfortable pole position with a time of 37.823. Phil Zentai continued his strong return to racing by grabbing second ahead of Michael Mifsud, round one winner Alex Baker and Barry Clough. Competitors were torn for tyre choice as they prepared for the opening heat on a drying track, and for Luciani it was second time lucky after the KA3 race, with slicks now being the right tyre for the conditions. Such was Luciani’s advantage, his fastest lap was just under a second faster than anyone else. 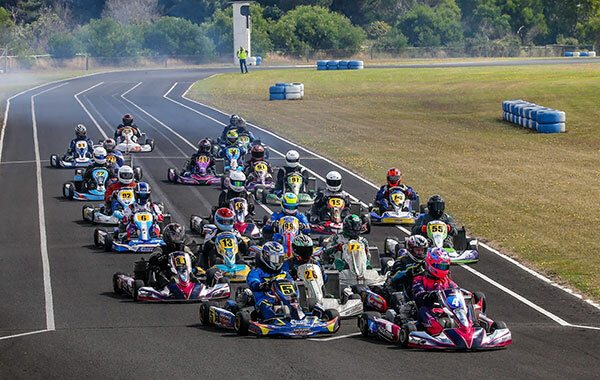 Defending Heavy series champion Andrew Harvey emerged through the field to second, followed by Mifsud, who had overcome Zentai on the last circulation. Clough earned his spot in fifth after dropping well down the field on the opening lap. Luciani proved to be in a league of his own again in heat 2, winning by 6.5 seconds. 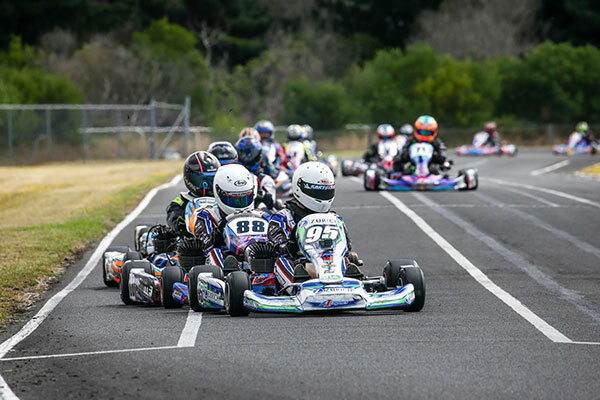 Harvey had second in his grasp most of the race, before being passed by Mifsud on lap seven and eventually settling for third. Baker raced hard from sixth to fourth to finish ahead of Zentai. Lights to flag again in the final for Luciani as he completed a comprehensive performance to clean sweep the class. Zentai raced well to be the best of the rest after starting fifth, after plenty of positional changes between second and sixth. 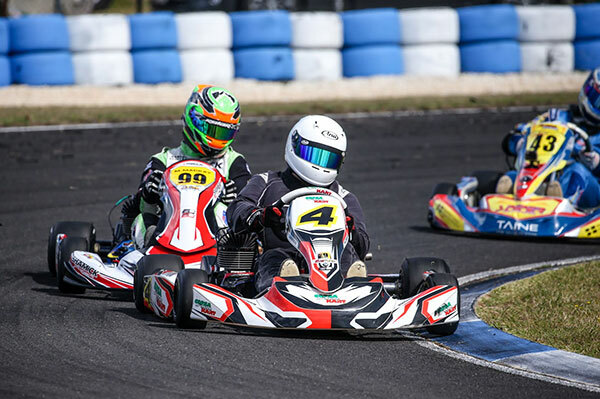 Mifsud and Baker settled into third and fourth from mid race, whilst Clough snuck past Harvey on the last lap to take the last position in the top five. 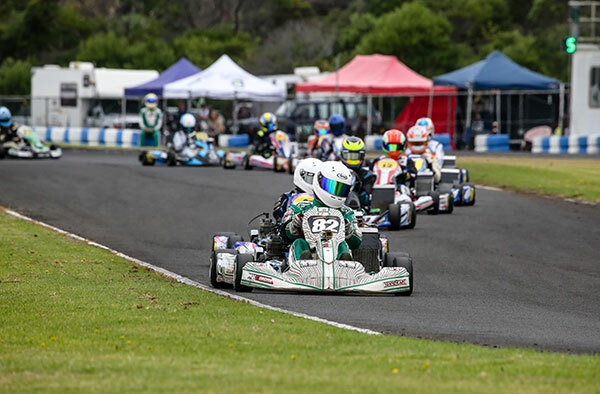 Christian Cowie picked up exactly where he left of in Warrnambool, by putting himself at the top of the timesheets in qualifying with a time of 37.584, only just ahead of his rival Harrison Campbell. Mason Kelly and Jake Santalucia were almost inseparable in third and fourth ahead of Thomas Patching. Cowie did the job in heat 1, leading from start to finish, despite persistent pressure from the equally impressive Campbell. Kelly raced in the top five all race long and found himself in third when the flag dropped, ahead of Santalucia, who had dropped to eleventh after an opening lap skirmish. Remarkably Jake Krasna moved from fifteenth to fifth in the drive of the race. Campbell grabbed the advantage at the start of heat 2, however it wasn’t long before Cowie regained the ascendancy and drove away up the road, winning by 3.8 seconds. Campbell was relegated to third on lap eight as Santalucia continued to show good pace and moved into second. Matthew Domaschenz made his first appearance in the top five, grabbing fourth ahead of Krasna. For the second round in a row, Cowie put together a perfect set of results, including a dominant 6 second win in the final. It will be interesting to see if he can continue this kind of form at Cobden. Santalucia got ahead of Campbell in the early stages and held on to a solid second place. Campbell appeared to have just missed the setup as he was eventually overhauled also by Domaschenz as well, consolidating in fourth place. Kelly capped a good weekend with fifth after duelling with Krasna and Parker Scott. 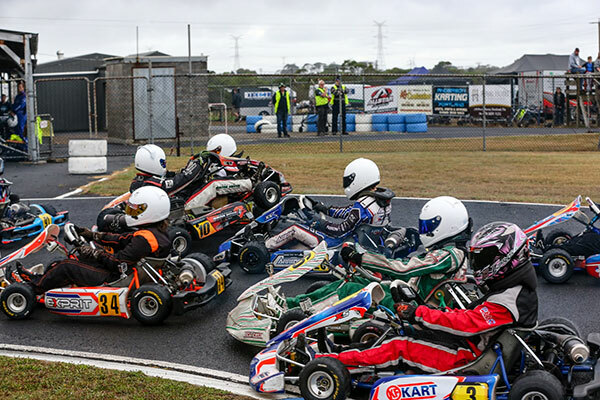 A big field of Cadet 12s rolled out for qualifying, not oversubscribed at this round after massive numbers in Warrnambool. Anthony Capobianco struck the first blow, recording the fastest time to put himself on pole with a time of 40.392. Angus Hall pipped 2018 Portland round winner Xavier Avramides for second, with Jack Szewczuk and Cadel Ambrose rounding out the top five. The top three remained unchanged in heat 1, as Capobianco, Hall and Avramides ran nose to tail, albeit well ahead of the rest of the field. Ben Holliday and Leo Iannella raced their way forward from tenth and eleventh to the top five, Iannella leading Holliday over the line. Once again it was the same three drivers at the top of the table in heat 2, but this time the race was far more interesting. Hall took the win, leading from start to finish, but never far away was Avramides and Capobianco, who both fought hard in the pack before rising to second and third respectively. Ambrose made solid progress for fourth, Iannella holding onto fifth. Capobianco made the best of the start of the final, leading every lap on his way to victory, putting together a very impressive weekend. Hall looked to have locked down second place, until a hard charging Ambrose got by on the final lap to relegate Hall to third. Avramides battled gamely between fourth and sixth for the distance, and maximised his position to take fourth at the line. Lochlan Farrell home in fifth after running as high as third. 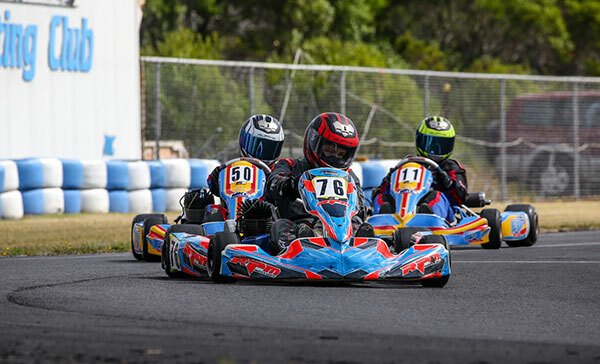 DPE Kart Superstore winners – 5 lucky winners picked up a $100 DPE voucher just for turning up and racing thanks to DPE! 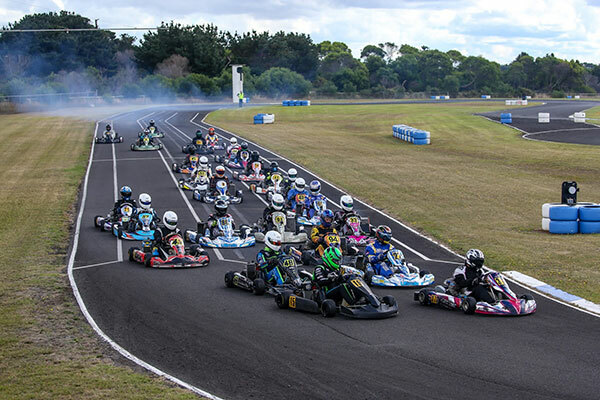 Dunlop Kartsport and DK17 winners – Dunlop and DK17 put together some excellent prize packs containing DK17 LubeIT, a Dunlop umbrella and a selfie stick. 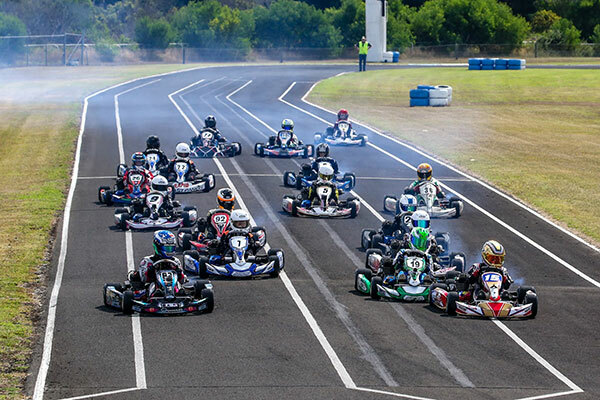 KartWorx and K1 winners – Each picked up a $100 voucher towards a custom K1 RaceGear suit thanks to KartWorx. That’s a wrap of an entertaining and well run weekend of racing. 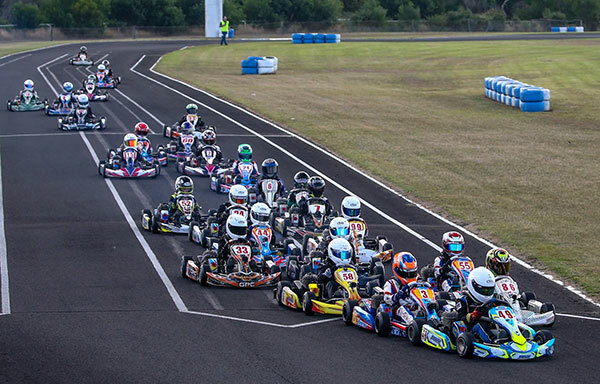 The series continues at South West Kart Clubs circuit in Cobden on June 1&2.